Most people have heard of equine therapy, but the term asinotherapy probably would draw many blank stares. Originally developed in Germany, this lesser-known therapy is actually a successful program that uses miniature donkeys. Since 2009, it’s been an integral part of Latham Centers, a residential care, education, and treatment center for children and adults with Prader-Willi Syndrome on Cape Cod. Prader-Willi Syndrome (PWS) is a complex genetic disorder that affects one in 12,000 to 15,000 births. It is characterized by an insatiable appetite, developmental disabilities, skin picking, and emotional and behavioral problems. Other children will “steal money, run away to get food, and eat raw or rotten food,” she said. Some individuals with PWS are of typical intelligence to their peers, attend college, drive, and have long-term relationships, Carroll said. Others have much lower IQs and need 24-hour support. However, intelligence isn’t correlated with condition. Carroll noted that children with average intelligence may have more challenges. According to Carroll, donkeys work better than horses with students at Latham Centers because the animals are smaller and calmer. 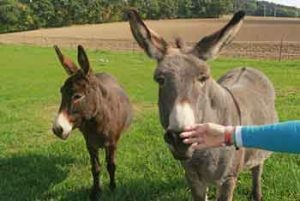 Students who participate in asinotherapy must pass a six-week training on caring for the donkeys and approaching them safely. Then, students work with the donkeys weekly, grooming and feeding them and cleaning up their pen for about an hour. The interaction prompts students to “use the power of their own calmness,” and gain the donkeys’ trust, she said. If they do something quickly or unexpectedly, the donkeys will lash out, kick, walk away, or yell loudly. “You can’t force donkeys to do something they don’t want to do,” which fosters greater patience, said Anne McManus, president of Latham Centers. Asinotherapy is motivating, she said. McManus described a particularly difficult case with a student who wasn’t interested in anything. “When the donkeys came on the scene, she was delighted. It was a turning point for her.” She started getting up, getting dressed and was ready to work. Asinotherapy also strengthens students’ self-esteem, confidence, and their ability to empathize and build relationships, Carroll said. Carroll believes people often hyper-focus on the challenges of PWS and discount the positives—a much longer list. Individuals with PWS tend to be extremely engaging, funny, and empathetic, she said. “When their anxiety is decreased, kids with PWS can be extremely successful in school, work, and relationships,” Carroll said. This success can happen for kids with the most challenging behaviors, many of whom make friends for the first time in their lives. “Really, it’s the environment that defines how successful the individual will be,” Carroll said. Margarita Tartakovsky, MS, is a Florida-based freelance writer and an associate editor at PsychCentral.com.